The Multiview Methodology for Information Systems Development has never been a widely used or mass-market approach. It has always had a small user base, a localised approach to a global issue: coherent IS development. This paper concerns the underreported innovation of the Multiview3 methodology for Information systems analysis, design and development – specifically designed for non-specialists working in developing countries. The innovation emerged from the identification of a methodological ‘gap’ in support for non-specialists struggling with Information Systems problem structuring challenges. The Multiview3 story tells us how IS methodology can be innovated to address the needs of users. 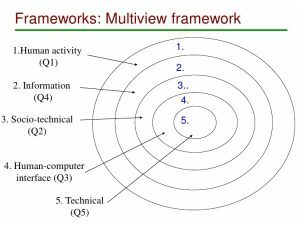 This version of Multiview is argued to be theoretically distinct from previous versions in terms of its focus (developing countries) and application (problem solving and co-learning in practice).